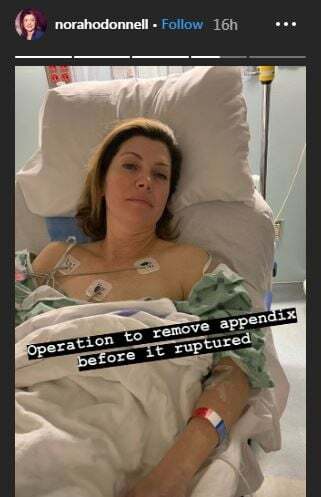 "CBS This Morning" co-host Norah O'Donnell posted an Instagram story about her emergency appendectomy at the Medical University of South Carolina on Feb. 22. Norah O'Donnell's spring break in Charleston included a trip to the hospital. The "CBS This Morning" co-host was taken to the Medical University of South Carolina on Friday for an emergency appendectomy, a hospital spokeswoman said. She was discharged later in the day after successful surgery. O'Donnell, a rumored successor as the network's nightly news anchor, posted an Instagram story where she wrote that she needed surgery before her appendix ruptured. 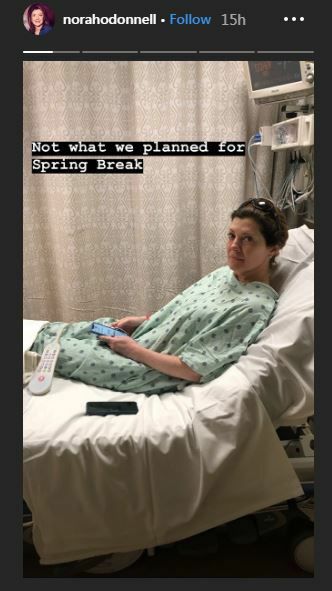 She included a photo of herself lying in a hospital bed wearing a hospital gown with the caption, "Not what we planned for spring break," followed by a short video she shot from her gurney with the caption, "Heading to surgery." O'Donnell thanked MUSC staff in other photos, writing: "Grateful for amazing nurses, surgeons and whole team." Her husband, Washington, D.C., restaurateur Geoff Tracy, tweeted his thanks, as well: "My life love and champion @NorahODonnell lost her appendix today. I was so worried. But team at @MUSChealth and her friends @CBSThisMorning made it a huge success. A spring break to remember." He also tweeted a photo of a smiling O'Donnell giving a post-surgery thumbs up. There was no word on whether the couple completed their Charleston excursion.